One of the first women to graduate with a degree in Mine Engineering, Helen Anatolievna Antonova arrived at Funter Bay in the fall of 1929. Born in Russia in 1904, Antonova traveled through China and Japan with her mother before moving to the United States. Her early life was spent in Siberian mining towns, and despite early work in theater, she always dreamed of becoming a mining engineer. She enrolled in the University of Washington’s College of Mines, the only woman to do so at the time (though not the first in the US). University of Washington Libraries, Special Collections, Tyee 1928, pg 57. Courtesy UW Digital Archives. As a female student in a traditionally male field, Antonova encountered much skepticism from officials and unfriendliness from classmates. She would later experience mistrust from coworkers (and their wives). 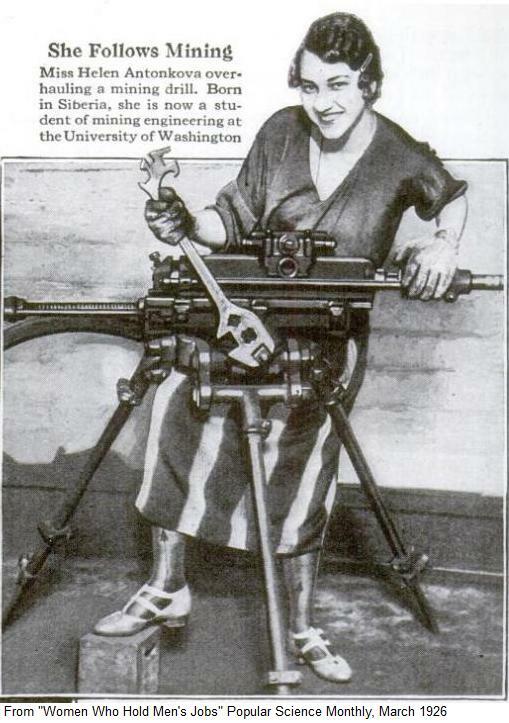 Despite being told by the dean that no one would hire a woman for mine work, she led a successful career as a mine engineer, working throughout the US. On several occasions she was offered roles in theater and in Hollywood, but preferred surveying and assay work over acting. After finishing her thesis and graduating in 1928, Antonova found a job with a mining company in Funter Bay. She recalled that the owner initially assumed her to be male, writing that he was surprised an engineer would have a woman’s name. Helen described Funter Bay as a small mining town, but noted that nothing could be purchased there. Despite its small size and remote location, Funter was home to a fellow female UW alumni. May Sophia Otteson (Tubbs) was a graduate of the class of 1916 and daughter of Charles and Mary Otteson, who ran another mine close to the one which employed Helen. Conditions at Funter were spartan, a house was provided for Helen and her mother but was poorly insulated and had almost no supplies. The mine owner’s wife suggested they bring their own wood-burning stove with them. Groceries and goods were brought out on the weekly steamer from Juneau. Some medical care was available from a nurse living at the nearby cannery. Running water and electricity came from a waterfall, and stopped working during the winter. Helen took these conditions in stride, sometimes standing in icy water while surveying. The mine was reportedly very happy with Antonova’s work, and begged her to return after she moved back to Washington state. Helen eventually married a Russian miner from Juneau (She mentioned that many Russian miners worked in Alaska, some sneaking over from Siberia illegally in rowboats). Her new husband became jealous of Helen’s superior position and income, and demanded they move back to Washington so he could pursue a degree of his own. She divorced him after his attitude and anger grew worse. 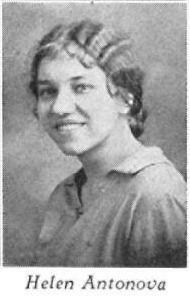 After moving back to the Lower 48, Helen held various jobs at mining and refining companies. She later married Nicholas All from New York (Her last name is sometimes listed as Antonovall). Helen Antonova All was interviewd in 1978 by author Joan Dufault, whose book Vintage: The Bold Survivors! contains more details of her life and experiences. This entry was posted on Thursday, May 28th, 2015 at 12:09 pm and is filed under Alaska History, Funter Bay History, Funter Bay People. You can follow any responses to this entry through the RSS 2.0 feed. You can leave a response, or trackback from your own site.